We decided to be spontaneous and go blueberry picking. Well, not quite so spontaneous…I had gone before with the little ones, but decided one of the beauties of multiple kids is the cheap labor. So train them well when they’re young…it’s so worth the hard work! My sil happened upon the most amazing find. Are you ready – a gentleman’s front yard covered with organic blueberry bushes, with a note scribbled on the picnic table that says to pick all you want, and leave the money in the jar. You GOTTA love the country. Now for the BEAUTY – $5 a GALLON!!! Do you know how many blueberries fit in a gallon…. Do you know how much time it takes to pick a gallon…MORE! Well, 5 minutes into our picking, the skies grew VERY dark. No, that’s not a bad picture…it grew very scary. Sheer bedlam, I tell you. “Pick, Pick, Pick, as fast as you can,” I urged frantically. It is NOT going to rain on my spontaneous parade. A little thunder never hurt anyone. Well, the Lord had other plans, and since I had a choice to let the ‘AH HA’ moment slip away, and have my beautifully spontaneous moment ruined, or find joy in the little things…. I CHOSE JOY! 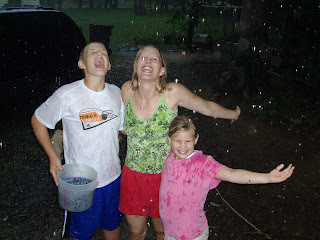 When is the last time you sang in the rain? Forget singing in the rain…when is the last time that you danced in the rain? 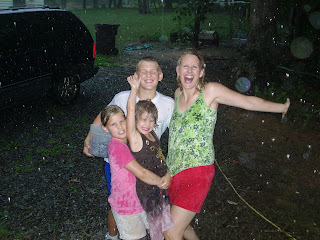 We were already drenched, and so when we pulled in the driveway, I decided to have a blast in the downpour. It didn’t take much to convince 4/5 of my kids. We twirled, and giggled and hugged! OH MY…I can’t urge you enough to let loose. just living LIFE to its fullest, and sharing it with my family. I let my eldest off the hook . My power of persuasion waned with him. I needed a camera man so he came through…in the rain…getting wet. I must point out that I am completely being “real” to post this amazing outfit. I know you are all jealous, wanting to run out and copy my unbelievable fashion. When you have the “it” factor – what else can be said? I put the tank shirt on to paint, and threw on my PJ shorts since they are SO comfy. I “knew” no one was going to see me blueberry picking, so what did I care? Remember…it’s the little things that are the big things. Lord, you are so good to bring me beauty from bedlam. and this was one of the best balancing acts ever! What a wonderful blueberry picking rainy day! 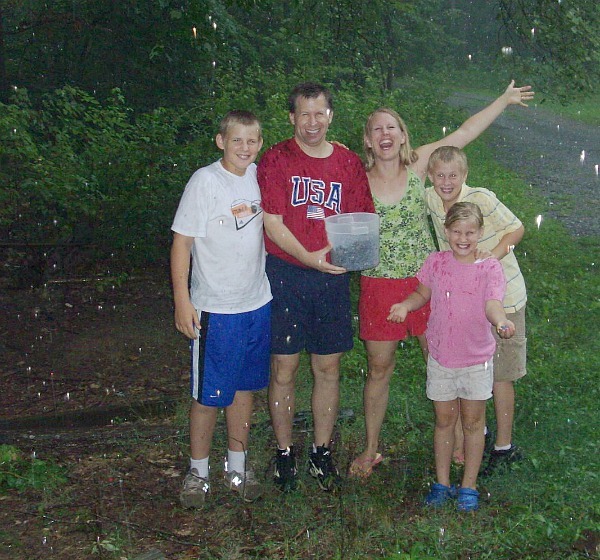 You are a fantastic mom and your children will remember this forever–so glad you had your camera! And that scary sky! Oh, and you can rock an extra 10 pounds girl! Why is it that our imperfections are so much more obvious to ourselves? I am so proud of your mistreatments! My favorite is how you got the twiggy hearts and tore out the sticks that were in the way of hanging the fabric–you have no fear! What a loverly yellow wall and beautiful surroundings! When I say you can rock an extra 10 pounds–that means that you can so carry it and hide it. did that make sense? Hi Jen! I have loved reading your blog! 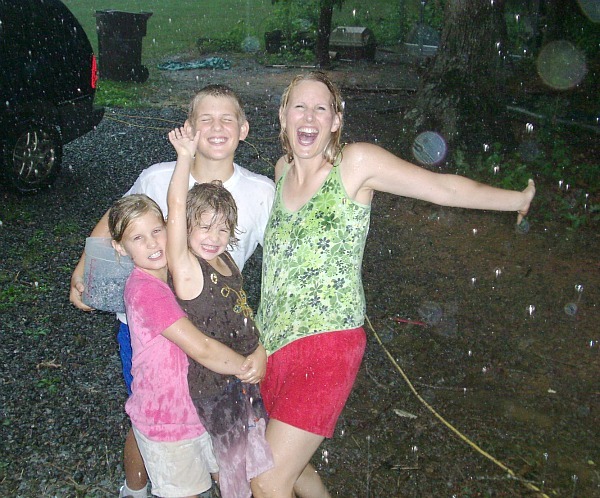 It looks like you and your kids had tons of fun in the rain. I can’t wait to come back and see what you have next! I saw your blog link in the OUAF email list. I love your window mistreatment! Mine only have blinds and I’ve been wondering what to do that won’t obstruct the view. And I love country design, so your twig hearts would be perfect. If I can only get the nerve to go for it! Love the window! Yellow is such a happy place! Thanks so much for coming to visit the blog…I think we could be new best friends! LOVE that you loved the rain and never miss a good mudpuddle when I can avoid it! Thanks for leaving a comment. I know someone who lives near their extended family with about 19 cousins … you don’t happen to have a brother with 9 children, some who have been adopted, do you? The 1st step is the hardest step when it comes to mistreatments! Now you’ll just go crazy! I love picking berries, we were rained out last year too, but just in the nick of time! Great mistreatment! What a good idea to use the twiggy things! And the blueberry picking looks like a ball. We got stuck in a downpour a couple of weeks ago while taking a walk in the park. It was fun! About the 9 kids, no, I don’t think it is the same one. Living near family is such a blessing, though! We live next door to my family and it is GREAT! Thanks for stopping by my blog today (or was it yesterday). Anyway, that blueberry picking looks like fun stuff. And singing in the rain – awesome. Kids love that kind of fun. What sweet memories! Singing in the rain looks like fun. Isn’t this what life is all about and yet I find that too often I’m just too doggone busy to simply enjoy whatever comes my way, rain and all. You have inspired me greatly and what your son said…oh…somebody pass the tissues please! I’m so glad my BFF Kat found this post and linked to it today. I needed to hear its message again, particularly after the day Kiddo and I have had today.